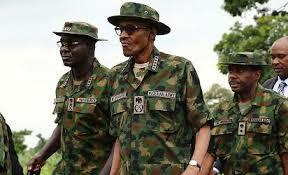 Chief of Training and Operations, Nigerian Army, Major General David Amadu, during a press briefing in Maiduguri on Friday disclosed that Nigeria's President, Muhammadu Buhari will visit Sambisa forest, the former stronghold of Boko Haram insurgents, on Monday, 27th of March, 2017. He said the President will be at forest to declare open the Nigerian Army Small Arms Championship, (NASAC 2017) scheduled to hold there. According to him, the championship aims at testing and shaping the intelligence and professional capacity of the Nigerian Army officers and soldiers as well as equipment. Buhari is to be accompanied by the Minister of Defense, Alhaji Mansur Ali and Service Chiefs, Chief of Defense Staff, General Gabriel Olanisakin, Chief of Army Staff, Lt. Gen. Tukur Buratai, Chief of Air Staff, Air Vice Marshal Abubakar Sadique and Chief of Naval Staff, Vice Admiral Obet Ebas.